Having grown up in Los Angeles, Dr. Rob attended UCLA where he received his B.S. in Physiology with an Honors Thesis. 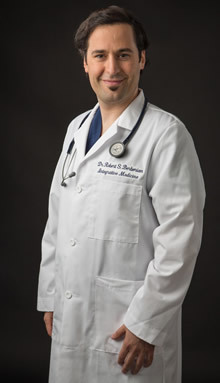 Prior to medical school, he completed a Research Fellowship at Johns Hopkins University School of Medicine in Neurology. Following, he received his medical degree from Western University of Health Sciences. Upon completion of a three year Residency in Family Medicine at Glendale Adventist Medical Center in affiliation with Loma Linda University, he continued on to a two year Fellowship in Integrative Medicine at the University of Arizona studying under Dr. Andrew Weil. In addition to Dr. Rob’s traditional schooling, he studied meditation with a pioneer of the mind-body connection, Dr. Deepak Chopra. Dr. Rob’s frustration with the way medicine is currently being practiced drove him to start his own private practice to provide patients with a greater level of care and sensitivity regarding all the issues of health, disease and illness. While in residency, Dr. Rob’s father was diagnosed with lymphoma, a form of cancer that attacks the lymph nodes. While his father was going through chemotherapy, there was no additional support provided by any other doctors regarding the spiritual aspect of experiencing such a difficult transitional time in life. Dr. Rob spent the next few years making sure to provide the best care possible to allow his father to be in the best spirit as he was going through several rounds of chemotherapy and stem cell transplant. This kind of treatment takes a toll on one’s spirit emotionally and physically. Sadly, the cancer returned for a third time and Dr. Rob’s father passed away in April of 2012. He was with his father as he took his last breath, witnessing the transition from the physical life to the spiritual life. He is at peace knowing that he did everything he could do to make his father as comfortable as possible during a difficult and scary time. His passion for medicine and the fight against cancer is the main driving force in setting up his private practice Whole Health & Soul, which is in honor of his late father’s dream of seeing his son fulfill his calling in life. A portion of the profits will be donated to various cancer charities. Dr. Rob’s mission is to have every single person in this world take responsibility for their own health and live a healthier and more fulfilling existence to help prevent disease, illness, cancer and emotional distress. Whole Health & Soul can provide you with the support, information and organized plan to take charge of your life, health and spiritual wellness to lead you into a stronger and healthier life, full of love, happiness and enlightenment.